This is specially designed Tea Box for Diwali and Christmas Gifting. Create a beautiful traditional Indian gift hamper with marble chopra, roli chawal and greeting card. All things signify festive fervour & are useful in the traditional puja. The Chopra is made of pristine white marble & designed like a nariyal adding to the auspicious occasion. Gourmet food hampers with choicest of International food products. It makes a beautiful , well thought and musch appreciated gift to leave a long lasting impression. Thoughtful gifts that are " off the beaten track " . Unwind with an Eye Pillow, a Foot Soak and get a good nights sleep with the Pillow Mist. Various combinations are available from our range. 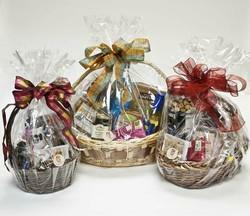 Customized Diwali Gift boxes and Hampers. Presents HEALTHY; TASTY; UNIQUE & Attractive - Combo / Gift Packs ! A limited edition hamper with an assortment of guilt-free indulgence waits in this handmade box. It's a perfect gift of health that will satisfy the pickiest demands of a true food connoisseur. Himalayan honey, cold pressed coconut oil and trail mixes combine nicely to make the perfect personalized super-food gift! Personalised Gift Hamper a unique combo set for men exclusively designed made in Leather/Foam as per your need with logo embossed/screen printed on it.We manufacture a whole lot of leather items such as wallets cardholders passport pouches strolleys duffle bags laptop bags back packs travel bags etc in different designs with logo embossed on it. Range of Products in Ochre Yellow. Can be used as a Wedding Gift Hamper. Send Gift to India by MyFlowerTree one of the best online florist offering quality services.